Barack Obama, Liar in Chief | can i just finish my waffle? ← Did Roberts cave to media pressure and the Bully ‘Bama? Now that the Supreme Court has affirmed that Barack Obama is a liar by ruling that Odamnacare is a tax, after he has gone around the country and on national tv and told the Amerian people it was not a tax, and it’s time to take a look at how his entire life is a lie. He can’t seem to tell the truth about anything. Barack Obama’s America is eerily reminiscent of “The Emperor’s New Clothes,” where almost everybody sees the truth about their leader but is afraid to say it out loud. 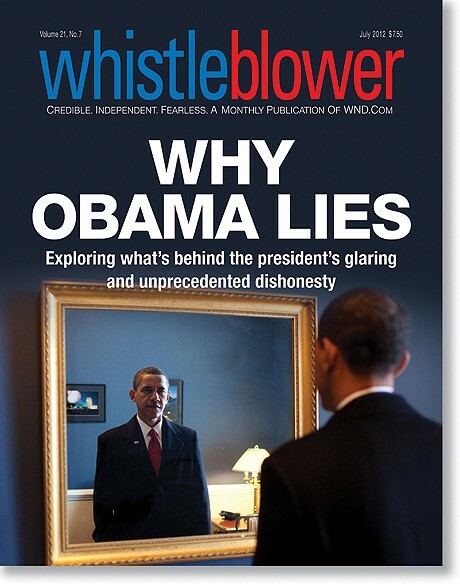 But as documented in the scorching July issue of WND’s monthly Whistleblower magazine – titled “WHY OBAMA LIES” – America has never seen a chief executive misrepresent the truth as deliberately, recklessly and effortlessly as this one. Posted: 07.02.12 @ 6:31 p.m.